This. App. Doesn’t. Want. You. To. Work. This app is useful in looking for jobs but not applying. You can fill out the Snag-a-job Application as much as you want but then you’ll receive an email later talking about it’s “incomplete” even though when you go back to finish it, it says complete. You’ll waste your time applying for any job through here, the app might as well hire themselves to get a working app. This was a very good/helpful app in its prime. Frequently it will glitch and send me back to the search page, when I am in the middle of an application. Or it will shut down completely. 95% of the jobs listed are way old (even if it says it’s just been listed). The other thing is, I find something, I click on it to do the application, and there’s nothing in my area! Even though it’s specifically says it’s where I live! This isn’t just the issue with this app. It’s all the others just like it as well. I’m deleting them all and just going to go to the unemployment office. The last few times I’ve tried to use it, I’d search under a certain location, and when I got to the bottom of the first few jobs listed and tried to scroll down, it tried loading and says there was an error loading my search. I’ve undownloaded it and nothing has worked. It’s not really a good app. I had this app for a while and so far nothing like I haven’t had calls from no one. It’s not the app for me! don't use if you're seriously looking for a job! tried this non-working pile of crap for about 5 weeks and still unable to get a job! i finally learned this app is just garbage and they get profit when people use it, they give 0 f**ks whether you get a job or not. finally after visiting walmart careers, i waited only 2 days and got hired! This app will ask you the same ton of questions for each job and I’ve filled out hundreds and haven’t heard from one. I think think the people who write good reviews are fake. The app is good but I don't understand how it's not showing up as a app on my phone. I have to go through my emails to get to this. But it says it's downloaded to my phone as a app. Someone explain this please. I applied for many jobs.. I like the one click feature but not many job openings had it. After a week only one contacted me and I had an interview. During the interview she asked me what I was applying for and it turned out that the post was over a year old even though it said posted a month ago. Umm embarrassing. So I was interviewing for a non existent job. All other jobs I have applied for say either, “status not available” “delivered” the only one “reviewed” was a the one I interviewed for. Plus I’ve had tons of other “job” spam emails since signing up. Not for me. Always getting something went wrong try again? All it’s been doing is saying is there’s a error with loading the page which is every time I get on the app it’s a waste of time. I don’t know what this new icon is suppose to be but it’s so ugly it makes me want to delete it. That and all the jobs stay on there way past when they were posted so you apply to something only to realize it’s 6 months old. No one ever replies back anyways.?! The listings won’t stay open for longer than a minute and crashes frequently . Can’t even use the app. on iPhone 10x and have latest iOS updated . You might have to update your app too. This app is great and all for finding a job but when you scroll down it keeps telling me “error couldn’t load jobs” an I’m connected to my WiFi and everything. Honestly It’s too slow and most of the time the app is confusing to use. Not the best app to apply for jobs. I mean it’s pretty useless app since it always has an error saying it can’t show you the job application. It all the jobs that I have wanted to apply for I have had to go to the official website of the place hiring to apply. This app used to be great, but lately I just keep getting an error message that there is a problem. It’s very frustrating. It’s been shutting down on me in the middle of an application and I can’t get back to it through the company’s site usually. And there’s so many apps I can’t complete because of this issue. Or it just doesn’t show any jobs near me and I know there are. Please add more jobs I haves read and views all the jobs but theirs none I’m interested please add more jobs that I’m interested or that I can apply to please. 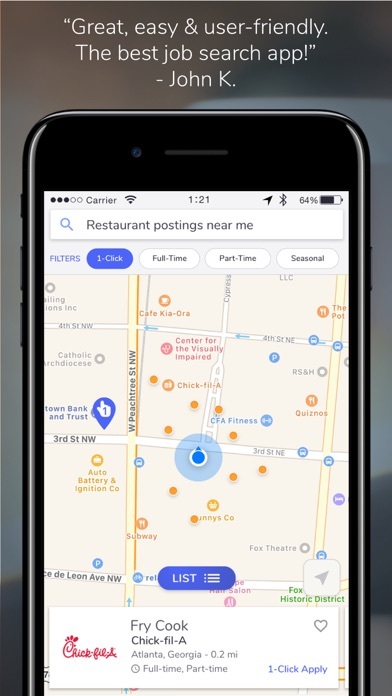 When searching for a job I hope to use this app to find a job. What it’s meant for. With how much it crashes (not my phone, have a brand new iPhone), along with how you can’t scroll down a page without it saying it can’t load search results, it’s not worth a second of time. Especially with how much time one can spend searching for a job. 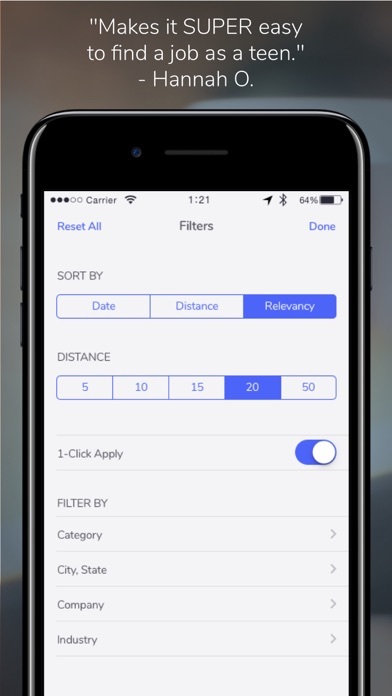 Great idea for a app if someone makes a working one. This one simply won’t work. How does this seriously pass quality control? I receive nothing but “oops something went wrong” with just general operation of the app even after reinstalling. No cool. Every time I apply for a job and I try to import my resume. The page just kicks me out completely and whenever I try again to import it, it keeps kicking me out. I downloaded this app a month ago, I deleted it after filling out Several application in not being called. A week after deleting this app, I received my first call for a Interview and was hired. Easy app a bit of a wait but over all good. I filled out an application to a job, mind you I’m 15. And the hiring manager called the next day! I got the job the following week after all paperwork was done. This app would be great if it would allow me to properly use the search and map feature. All I ever get is “We’re sorry, there was an error in loading your search”. I redone loaded the app recently due to my need for another better job, and I’ve got the same thing again. All I can actually use are the daily results but after that, I’m unable to use the rest of the app. 75% of the time when I try to make a search, I get an error message over and over again. The idea of this app is amazing. However, all I ever see is repeats of the SAME job over and over, or ‘survey takers’. Not the right app for me. I want authentic jobs and a wide variety. Not repeats. This app doesn’t even work properly, you’re better off just going through the internet browser. Waste of time it wouldn’t even allow me to finish any of my applications. Every single application I’ve tried to submit through the app would get erased and kick me back to the beginning after uploading a resume to the employer’s website. Very frustrating. The app won’t let me log in. My information isn’t wrong. I hit “Sign In” after I enter my stuff and it just goes back to the sign up page like nothing happened. I’d like to actually be able to use this app for its intended purpose. Snag helped me get a job the day after I used it! Plus other companies were responding to my applications, which was a first! If you want to work then this is the app for you to find a job. Seriously needs a bug fix or something. Every time i get to an application for a job and go to upload my resume from my files it kicks me back to the start and won’t let me proceed anywhere after that. I know my password and email it would attempt to log on but than it would just stop the attempted log in. Would be nice to log in and actually apply for the job. Ever since the change from “Snagajob” to “Snag” the app fails to load applications, even simple one clicks continue to say “error”. PLEASE FIX SOON. The most recent update has proven unreliable to finding a job based on mapping area. Anytime I go to look based on my own zip code, I am presented with "200 jobs, 200 unmapped". Even zooming in to areas that I know are still hiring by virtue of regularity will still say "1 job, 1 job unmapped". I found a job within a month, and it only took a month because of the review process for the application. Applied for over 300 jobs within the course of 3 years and literally no luck at all they got some old job posts from like 2016 total waste of time the employers don’t even contact you ... atleast indeed has better job updates within a 24 hour period !! I am 17 turning 18 and was, unfortunately, not able to get any real work experience. My mom didn’t want me to work because it would interfere with school. I was finally able to go out and apply for jobs and after applying for 14 jobs in 2 days, not even within 5 hours I was already accepted for an interview. 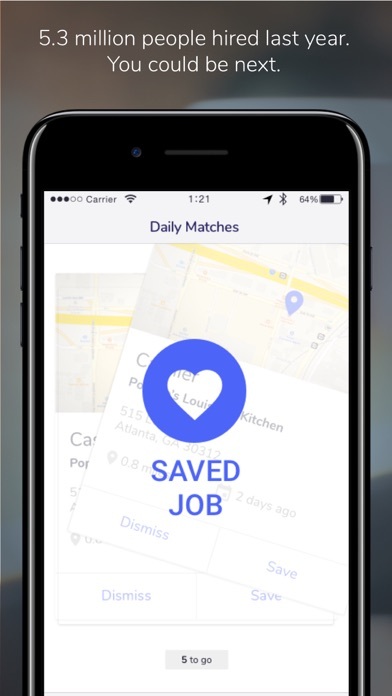 This app is amazing and I could not have gotten a job so quick without it! Thank you, snagajob! This app would be a million times better if it gave you the option to upload your resume. That way employers see what actual qualifications you have /experience. Uploading each past job is time consuming. I rated a 3 bc the only thing I hate ab this app is how after we apply for some where we can’t see our application any more. Or any information from it ie : the number for a manger, from the building or anything like that. Also how most job distances are very incorrect. I’d go to apply for a Wendy’s and it said it was close to me ( 1.8 miles ) only to find out that it’s ab 8.8. When I am near finished with an application, it wants me to upload a resume, I then upload and the resume and the application ends and I go back to where I have to apply for the job again. This is so frustrating when you almost completed an application and it sends you back from the start with no sign of you successfully sending the application and resume. I applied on a Tuesday, got an interview a few days later on got hired in less than a week! There is someone willing to hire you and it’s quick , easy and convenient! The jobs don’t even be loading for me in the daily matches are the same thing of sponsored companies like Lyft or Amazon. Now , As a 16 Year Old, You Don’t Necessarily Have A Large Stack Of Cards To Pull From , I Applied to 4 different jobs ( which totally isn’t alot and that’s exactly why I’m surprised I landed a interview so quickly) With One Contacting Me Today For An Interview Wednesday At 4 . Btw, Use ResumeGenius If You Don’t know where to start ! Every listing is apparently 30+ days old. That’s no good. As a 18 year old who recently got terminated at Walmart for calling out because I was in the hospital, I didn’t know much about job hunting because I was a Walmart cashier since I was 16. I downloaded all the apps and deleted all of them expect this one. And I have to delete this one too now. Why though? I got a job at chipotle! Without this app I don’t think it would of been possible. Highly recommended. Crappiest app I’ve used can’t even sign in. Been at it for 1h now trying to reset the password for an account that I’ve made, have tried to make another keeps saying failed, and that I have the wrong password. Don’t choose this app for a job just get in your car n go find somewhere hiring. I’m 16 and have been looking for a job for a while now. In the first 10 minutes of me searching I found a job at Mike’s Carwash. Because the app was so easy to use I found it very simple to write an application and figure out exactly what I wanted to do through this app. The one click applies are fake. If you press the 1 click apply jobs you will be taken to their website to fill out an application. Only 1% of job choices are 1 click apply. On top of that the mileage is in a circular radius. It does not do road milage. If you need a local job paper applications are the way to go because there is no such thing as a job search with a road milage. Quick, fast, helps a lot. Downloaded this app and found a job within a month. I downloaded this app and less than a months later I just had my first interview! I did apply for 17 jobs, but the one I got a callback from hired me. The process is super easy, and the one click applications are convenient. It saves your info so you can auto-fill your info and not have to type the same thing over and over. You can filter places and types of jobs. Definitely would recommend if looking for work. I love this app. It keeps a perfect, detailed file of my employment history, my availability, my experiences and achievements and it's easy to update and edit any time. 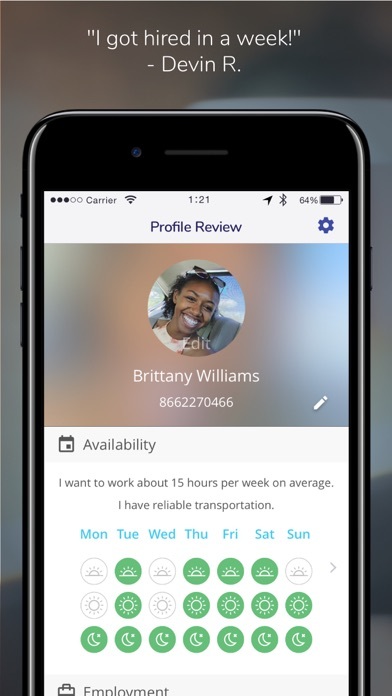 I have been contacted for interviews several times and successfully hired every time using this app. There is just no better way to job hunt! It’s a very well done app for sure, but it does glitch when it comes to signing in, if the password is wrong the screen will minimize and make you think you actually signed in, but in reality you didn’t. I absolutely love Snagajob! Every job I've ever had was through them! Never fails to impress me! I've been using this app for a while now and I've barely heard back from any of the jobs I've applied to. Plus Snagajob constantly sends me emails asking if I've finished my applications over and over again (For the 100th time yes!). Also I've really become skeptical about the authenticity of the app because I am constantly emailed by and recommended to apply to scam companies. I will be switching to Indeed. After I Updated It No Longer Shows Jobs Within My Area When I Hit Near Me Even Though My Location Is On. Found a few jobs I've found interesting, will write back with results! Best way to find jobs, been hired quickly! Great concept but poorly executed. Nearly half of “job listings” are outdated and unavailable. In-app interface is ridiculous, you press “back” and it closes out your entire application forcing you to resubmit all of that information? Ridiculous, must have spent 30 min on one application to have the APP itself blank screen and close out my in progress application and erase all progress! I’ve been using the app for a while and it has been useful. I have, however, been experiencing a few issues. The job descriptions will not load, making it almost if not totally impossible for me to find work as I cannot read the job requirements. This has been happening since I downloaded the app almost a month ago. I found this app 4 years ago,& got a job INSTANTLY!! Got another job last week,which i declined for to MANY hours,& have gotten 5 calls in the first week! !Dont gove up!Widen your searches!! 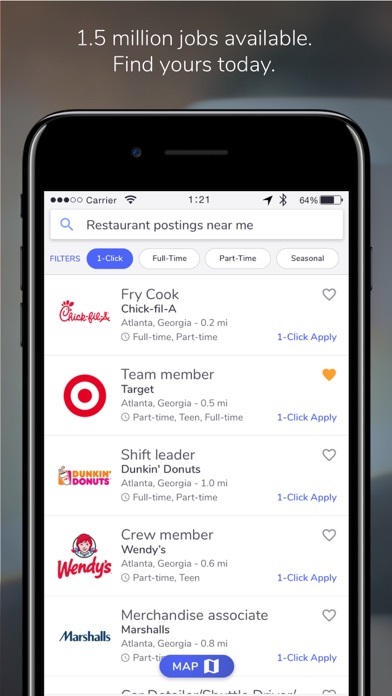 Pretty cool app to find job that are hiring and some in you interest. I’ve found all my part-time jobs on Snagajob. 🙌🏾 The app is super easy and fast! My name is Tanua Huston. Looking for work at home healthcare or a provider or I can do housekeeping please call 956207 3620. I’ve had this for a year and I have not received a job from it. Its as if nobody uses this besides people who NEED a job.. I uninstalled and go never return or allow any of my family members use. WHATS MY 4 DIGIT PIN?? Every time I tried to apply it asked for my 4 digit pin... maybe I’m dumb but could some one help me? On my second day of using this I got an interview, filter by date so you can get the most recent job offers in your area for a better chance of getting contacted. Every time I try to upload my resume it kicks me out of their website and sometimes I click on certain things and it will take me to a blank screen? I like how you have easy job searches and how they find jobs closest to you, but I applied for jobs and it’s never really successful. I got a message that said that the manager didn’t check my application so another department would. I’ve been waiting a long time for someone to accept my application but there is never a response or I’m never chosen. I chose this app because I’m a teen and this was supposed to be a way to find a job easily. It has been anything but that. I’ve had this app already a month & the place I applied at hasn’t even contacted me for an interview but they reviewed my application .? So like should I contact them to get a job .? I love how easy and fast it is to apply for jobs! Some information will auto-fill and some jobs offer a one click application. I also LOVE that it tells you if your application has been reviewed by the employers or not. I haven’t gotten a call back from anyone yet but i’ve only been using it for about a week and a half. i’m still confident in this app! The app looks really good; kudos to the designer/developer but there are still a few issues that decrease the quality and overall effectiveness. Descriptions of jobs are cut off, doesn’t take you to the correct page when you hit Apply, the in app browser doesn’t load anything and has no option to send it to open in the browser where it could potentially work. Thus, it’s fairly useless. I’ve been applying for so many jobs in this app and still haven’t gotten any interviews. I can’t login to access my account anymore. I’ve been using this app for years and I’ve had plenty of jobs because of it. But this past week , I can no longer use the app because it’s not letting me log in anymore. Just keeps jumping back to log in, and I can get on the site on browser so I know my log info is right. Update is needed maybe??? I love snagajob, but never really has jobs posted on here that’s close by to me, instead the next town over. I think this app could use another update though, screen freezes or just don’t load in general. I love this app, it’s helped me find multiple jobs you out all of your information about school hours and past jobs on here and it’s easier to apply when you click one apply.